Now with Marcomedia 'Hotspot' links, move your mouse around and click on a RAM product number or graphic. RAM introduced white LEDs to the hobby industry in 1998. Since that time we have produced many thousands of systems that have set the standard for high brightness, ruggedness and long battery life. The new "plug and play" systems can be powered by 4.8 volts from your receiver or any other battery source up to 12 volts through the included connectors. All the systems use 3 or 5 MM white or colored LEDs with lense caps where appropriate and many have power switches. RAM is the only company that offers this versatility in such a wide range of products. What else would you expect from a company that has been in business since 1976 and offers almost 200, assembled in the U.S.A. products. The systems are light, compact, assembled in the U.S.A. and ready for installation. LIGHT BASKETS. These preformed 3/4" x 3/4" x 2 1/4" generic baskets are provided FREE in all appropriate RAM car light systems to simplify scale installation of head lights and tail lights. wire are powered by 4.8 - 12 volt battery or for over 4 hours by a 9 volt alkaline battery. ne nav lites with flashing white LEDs at each wing tip and the top and bottom of the fuselage. This 8 foot (96 inch) span set has 3 connectors so that it can be expanded to fit larger models. Comes complete with a power switch and uses any 4.8 to 12 volt battery. connectors, to simplify installation. Comes with a power switch and uses any 4.8 - 12 volt battery. RAM 123 LANDING LITES. The new 123 has two ultra brite, white LEDs, each on 3 feet of wire with connectors and a micro switch which can be controlled by the throttle, flap or retract servo. Use any 4.8 - 12 volt battery. RAM 124 NAVIGATION LITES, GIANT SCALE. This system now includes 4 ultra brite LEDs, 3 nonflashing red, green and white nav lites with 1 flashing white LED for top or bottom of the fuselage. This 14 foot (168 inch) span set has 2 connectors for easy wing detachment and a 6 foot wire to the tail. Comes complete with switch and is powered by any 4.8 to 12 volt battery. RAM 125 NAVIGATION LITES, NON FLASHING. This system now includes 4 ultra brite LEDs, 3 non flashing red, green and white nav lites with one flashing white LED for top or bottom of the fuselage. This 8 foot (96 inch) span set has 2 connectors for easy wing detachment and a 4 foot wire to the tail. Comes complete with switch and is powered by any 4.8 to 12 volt battery source. RAM 130 GAS CAR HEADLITES W/BRAKE LITES. Similar to the RAM 120 above but the two red tail lites are controlled by a switch attached to your throttle servo so they brighten automatically when the vehicle slows down. Now includes connector for servo mounted brake switch, allowing for easy body removal, powered by any 4.8 to 12 volt battery source. RAM 132 PARK FLYER NITE LITES This system now includes 4 ultra brite LEDs, 3 non flashing red, green and white nav lites with one flashing white LED for the top or bottom of the fuselage. For models to 48 inch span, our new plug and play power connectors attach to any model so there is no need for Y connector or an extra channel. This 7 gram system draws only 6 MA in a 10 minute flight from your 4.8 to 12 volt battery source. RAM 133 MAX LITES This system has all the same features as the RAM 130 above but with wire lengths and instructions for the larger, most popular MAX chassis, powered by any 4.8 to 12 volt battery source. RAM 136 MICRO HEADLITES & TAIL LITES This set is specifically designed to provide ultra brite 5MM headlites and 3MM red tail lites for 1/18 scale MICRO R/C CARS as well as smaller scale SLOT CARS. The system draws minimal power from 6 to 18 volts DC provided by the R/C car power pack or the slot car track. Add that final touch of realism to your racing fun! RAM 144 ULTRA BRITE RAM LITES Two, new, off road style lites have a 1" diameter light weight, aluminum, satin finished body with a threaded, 3/16" mounting stud in back for easy body attachment. Two nylon adapters provide for roll bar and bumper mounting. Powered by any 4.8 to 12 volt battery source. RAM 159 UNDER CAR LITE A 7" unbreakable plastic tube can be shortened, colored with paint and attached to the bottom of your model to provide the effect seen on full scale show cars. The tube is lit by two white LEDs powered by any 4.8 to 12 volt battery source. RAM 160 FOG LITES Two ultrabrite, yellow LEDs with optional yellow lense caps are powered by any 4.8 to 12 volt battery source. RAM 161 ARF LITES. In this new version of our popular, wireless ARF lites each module is now powered by a single, lipo coin cell that lasts over 24 hours and is easily and cheaply replaceable. The flashing red, green and white, quarter sized modules weigh a total of 20 grams and can be easily attached to any completed model. RAM 169 ULTRA BRITE RAM LITES W/ FOLDAWAY ROLL BAR. This roll bar won't tear up your plastic truck bodies when they roll over! Two #144 Lites are supplied with all hardware to make a roll bar which adapts to any R/C body. RAM 170 ULTRA BRITE HEADLITES. Two headlites, each on 1 foot of wire are powered by any 4.8 to 12 volt battery source. RAM 174 MICRO HELI LITES. This system now includes 6 ultra brite 3MM LEDs, 3 non flashing red, green and white nav lites with 2 landing lites and 1 flashing white LED. Our new JST plug and play power connectors adapt to ANY micro hell with no need for Y connectors or an extra channel. The 7 gram system draws 10 MA in a 10 minute flight from a 4.8 to 12 volt battery source. RAM 175 HELL LITES. For 30 and larger hells the system has 6, 5MM LEDs with the same lite features as the RAM 174. The 12 gram system draws 10 MA in a 10 minute flight from a 4.8 to 12 volt battery source. RAM 178 FLASHING ULTRA BRITE HEADLITES. Two, white 5 MM, LED headlites provide the flashing lites of emergency vehicles and pace cars. Powered by any 4.8 to 12 volt battery source. RAM 179 3 D LITES. 3 D flyers can now have a multi lite effect designed for them. This 18 lite system has 6 red, 6 green and 6 yellow LEDs, each color on a 24" strand. Total weight 23 grams, draws 30 MA in a 10 minute flight and runs on 9 to 12 volts battery source. RAM 184 SLOT CAR HEAD LITES and TAIL LITES. Slot car racers can add Ultra Brite LED head lites and tail lites to their 1/32 or 1/24 scale bodies and there is no loss of performance from track power with this mini system. Enjoy scale appearance and night racing! RAM 187 PARK FLYER PLUS. With 6, 3MM LEDs, this system has ALL the features of the RAM 132, plus 2 landing lites and up to 54" span. This 8 gram system draws 10 MA in a 10 minute flight from a 4.8 to 12 volt battery source. thousands of RAM products. Unless specified, the systems listed below are powered by a compact, 1.5 ounce, 9 volt alkaline battery or a 6 cell nicad. The systems are light and compact, completely assembled in the U.S.A. and ready for installation. Most systems are supplied with appropriately colored lenses which fit over the various bulb sizes. The 01, 05, 15, 20, 21, 33, 34, 36 and 66 utilize a 3/16 inch diameter, flat top lens. The 14 system uses a 1/4 inch diameter, flat top lens. The 02, 04 and 23 are supplied with a 3/8 inch diameter, dome top lens. Information for obtaining optional bulbs and lenses is included in each light system package. tem. If a bulb fails, snip it off with a 1 inch wire, insert it in a slot cut into a 3 by 3 inch square of corrugated cardboard, note the number of the lighting system and mail it to RAM. Obviously, this does not apply to bulbs that have been broken in use or installation or have been powered beyond specified voltage limits. Include $1.00 to cover packing and postage. RAM 01 PROGRAMMABLE FLASHING NAVIGATION LIGHTS. This system now features wing light wires to provide for a span of 94 inches which will accommodate 90% of the model kits currently available. A Deans connector provides for easy wing removal. The flash rate and duration of the red and green wing tip lights and the clear tail light are adjustable through a wide range to duplicate any scale operation. The assembled system contains the flasher circuit board with a 9 volt battery snap, connected to the wires and bulbs described above. RAM 02 ADJUSTABLE RATE "STROBE" LIGHT. The light is adjustable to any desired flash rate. The system contains an adjustable rate flasher circuit board, 1 high intensity bulb on three feet of wire, battery snap connector and a clear dome lens. The system provides a bright, adjustable strobe light effect. Weight approximately 1/2 oz. nected to the receiver to work independently or simultaneously with another control function and uses the 4.8 volt RX. pack for power. Weight approximately 1 oz., with generic receiver connector. RAM 04 ADJUSTABLE RATE MARS "ROTATING" BEACON. The light is adjustable to the desired "rotation" rate. The system contains an adjustable. "rotation" unit, 1 high intensity bulb on three feet of wire, battery snap connector, and one red dome lens. Weight approximately 1/2 oz. (nonflashing, may be used for some aircraft types). System contains 3 high intensity bulbs, each on three feet of wire, with red, green and clear lenses, 9 volt battery snap connector. Provides standard navigation lights. Weight 1/2 oz. Can also be powered by the RAM 64 Power Source. RAM 06 SKY LIGHTS. This system is the proven way to fly at night or in low visibility. Three light strands, containing 6 bulbs each, are used to light each wing and the fuselage so flight orientation is maintained with the familiar "T" shape of a lighted plane against a black sky The model must be of "built up" construction with little planking and covered with a translucent material such as made by Monokote. The assembled system provides for models up to 94" span and includes a Deans connector to detach the wing and a master switch. Using a 7.2 to 9 volt battery will result in a total glowing effect that cannot be matched by any other light system. RAM 07 LIGHT BAR. (Cars) The molded plastic light bar is 4" long with a chrome base and 2 red lenses, perfect for 1/10 and 1/12 scale G vehicles. The system includes an adjustable rate flash unit with two bulbs, each on 12" of wire. A 9 volt battery snap is provided or 6 cell car nicads can be used. Blue and amber lenses are available from RAM. CAR RAM 10 GAS CAR HEADLIGHTS, TAIL & STOP LIGHTS.Designed to provide an efficient 9 volt alkaline battery powered lighting system for gas powered cars and trucks. The system includes two of our #19 type headlights for easy installation. Two red tail lights, controlled by a micro switch, shift to bright stop lights anytime the throttle linkage drops from full power. Installation details and tips are included in the instructions. RAM 13 HEAD LIGHTS. Designed for Tamiya etc. molded grills. Two bayonet style, 1/4" bulbs, each on 12" of wire, allow easy installation. Comes with a 9 volt battery snap or 6 cell car nicads can be used. RAM 14 BIG AIRPLANE NAVIGATION LIGHTS. System contains 3 superbright bulbs, with red, green and clear lenses, a six-foot tail lead, 2 sevenfoot wing tip leads with Deans connectors, switch, and a 6 AA cell battery box. Nicad or alkaline cells are required. Weight 3 oz. RAM 15 NON FLASHING NAVIGATION LIGHTS. This set provides for models not needing flashing lights and also features wing wires for up to 94" models and a Deans connector for easy wing removal. Instrument bulbs with red, green and clear lens covers are powered by an alkaline 9 volt battery or a 6 cell nicad pack. Approximate weight, 1/4 ounce. 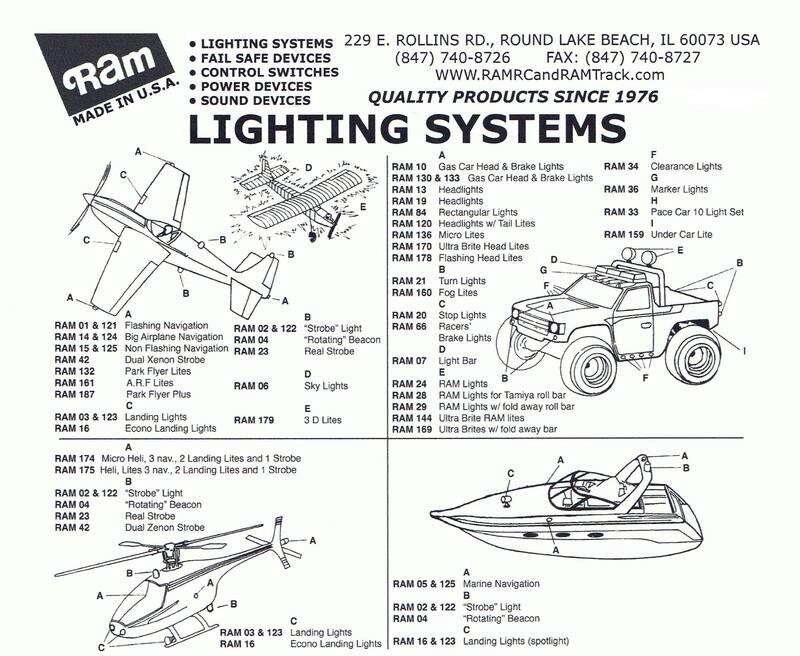 RAM 16 ECONO LANDING LIGHTS. System contains 2 superbright bulbs rated at 2800 beam candlepower each on 2 feet of wire, with new, 5/8" diameter, aluminum, focused reflectors, microswitch, battery snap connector. Switch attaches to retract, flap, or motor servo for control. Weight 1 oz. RAM 19 HEAD LIGHTS. The aluminum 5/8" diameter reflector protects the bulb in the toughest crash. Two lights, each on 12" of wire, allow easy installation. Comes with a 9 volt battery snap or 6 cell car nicads can be used. RAM 20 TAIL & STOP LIGHTS. This system is comprised of two red stop lights, each on 12" of wire, and a switching device that is simply wired to the electric vehicle's drive motor. Whenever forward power is reduced, the bulbs will go from a dim tail light to a bright intensity for brakelight effect. No power is drawn from the motor battery 9 V battery powers the system. RAM 21 TURN LIGHTS. Four amber lites are used to duplicate scale vehicle operation. Two microswitches control a flasher device to simulate turn light action automatically when the vehicle is maneuvered. Comes with a 9 V battery snap or 6 cell car nicads can be used. RAM 23 REAL STROBE LIGHT. This is the smallest, lightest, safest xenon strobe offered to the R/C modeler. The unit is 3/4" x 1" x 1 1/2", has adjustable rate and a power switch. Servo connectors to the 1" flash tube enables the modeler to use servo extensions to provide ANY length. The 1 ounce circuit operates for up to 8 hours on a 9 volt alkaline battery. base provides easy mounting. The 1 " diameter satin finished body can be used as is or polished to a high gloss. A 9 V battery or 6 cell car nicads can be used. RAM 28 RAM LIGHTS w/ TAMIYA ROLL BAR MOUNTS. Two #24 RAM Lites are packaged with two adaptors which mount to the Tamiya or similar roll bar. RAM 29 RAM LITES w/ FOLDAWAY ROLL BAR. Now you can have a roll bar that won't tear up your light plastic truck bodies when they roll over. Two #24 RAM Lites are supplied with adaptors and all hardware to make a fold away roll bar which adapts to any R/C body. RAM 33 PACE CAR 10 LIGHT SET. Add the excitement of a Pace Car to your collection of car bodies. This set includes 2 #19 Headlights with aluminum reflectors, 2 tail lights with red lenses, 4 flashing hazard lights with amber lenses and a RAM 07 Light Bar with 2 flashing bulbs and an adjustable rate flasher all wired into one system. You can use a 9 volt alkaline battery or a 6 cell car nicad pack for power. RAM 34 CLEARANCE LIGHTS. This 8 light set provides for all 4 sides of a truck, tractor or trailer. The 3/16 inch diameter, round, amber lenses are a near perfect replica of commonly used clearance, marker and running board lights. Use a 9 volt alkaline battery or your 6 cell car pack. RAM 36 CAB MARKER LIGHTS. This system has 5 aluminum scale 1" lights with amber lenses. Easilly mounted they are powered by 9 volt battery or 6 cell car pack. RAM 42 DUAL XENON STROBE LIGHTS. This deluxe, simultaneous flashing strobe system has two, 9/16" wide, U shaped flash tubes each with servo connectors enabling you to use servo extensions for tip lights of any wing span. The 1 1/2 ounce system has adjustable flash rate, a power switch and will run for 4 hours on a 9 volt alkaline battery. CAR RAM 66 RACER'S STOP LIGHT. Now R/C car racers have a small (1/2 x 1 inch) light (1 ounce) device featuring two, bright instrument bulbs with red lenses. Powered by the electric car battery pack, it will operate from 3 to 9 volts with either reversing or non reversing electronic speed controls. CAR RAM 84 RECTANGULAR LIGHTS. This two light system provides headlights for R/C cars and trucks as well as shaped lighting for other model use. The 1/2 x 7/8" lenses are typical scale size and can be used on the "face" of a model. Each light has a 12" wire to the battery snap for a 9 volt Alkaline battery or the 6 cell car nicad battery can be used. RAM 186 GUN FLASH. The system provides 4 flashing lights with adjustable flash rate and intermix, powered by a 9 volt battery. Mounted in the gun muzzles, they are controlled by a micro switch attached to the same servo that controls a RAM gun sound. These devices provide a variety of ways to switch, control and power RAM lights, sounds, and many other accessory devices that are commonly used in models. See a pictorial diagram Provides control of various circuits such as lights, auxiliary glow plug battery and electric motors. Adjustable "on" point at any preferred stick position and is direction reversible. The circuit board attached to a double pole, double throw relay, which can be wired in a variety of ways to produce control of two separate voltage devices or reversing action for a motor. Controls up to 20 amps of current. The device is 1 1/2" x 1 1/4" x 1 1/2" and weighs 2 oz. A generic receiver plug is attached. RAM 27 SIMPLE THROTTLE. This is the simplest way to get 2 speeds forward (high and low), off, and two speeds reverse for your electric boat or car. Reverse speeds can be eliminated for aircraft use. Eliminates linkage by mounting directly to the throttle servo. Suitable for 02 to 25 motors. System includes fuse holder and 15 amp fuse. 1 1/4" x 2" board. Weight 1 oz. RAM 30 4 WAY MULTI SWITCH w/ DUAL VOLTAGE OPTION. This is a difficult product to describe because it does so much and all from a rotary switch device mounted directly to a single servo. It will control 4 individual accessories on one voltage and 2 additional ones can be operated simultaneously on another voltage. Perfect for all those scale options on your model. RAM 32 SINGLE SPEAKER 4 SOUND SWITCH. This rotary switch attaches to the top of a servo and allows you to feed up to 4 RAM Digital sound devices through 1 speaker. A great space saver. RAM 35 SIMPLE R/C SWITCH. This device is a 3/4 ounce solid state switch for loads up to 5 amps and 24 volts. Features include LED monitor, adjustable "ON" point, reversible adjustment, optically coupled and is controlled directly by your receiver. A generic receiver plug is attached. The ideal way to control RAM lighting systems on your model! RAM 64 9 VOLT AND 5 VOLT R/C POWER SOURCE. Designed to power BOTH the 4.8 volt receiver system and RAM 9 volt light and sound systems from batteries of 10.8 to 18 volts. This simplifies electrical installations in boats since all systems can be powered by a single battery. The device delivers 1 amp for each voltage source and is both overload and short circuit protected. The size is 1" x 1 1/4" x 1 1/8" and a screw terminal strip is provided for simple installation. RAM 09 BATTERY BACKER. Radio manufacturers state that battery pack and switch failure account for 80% of all radio problems. The system provides a complete backup for both of these trouble sources. The device senses low or intermittent voltage from the main receiver battery system and instantly switches to the backup battery system. (This battery can be as little as a 100 milliamp nicad pack or a standard nicad or alkaline pack.) It then turns on a bright red LED so that you are warned that you are on the backup system. The backup battery and switch harness are required to complete the installation. The 3 amp system capacity is suitable for models using 4 standard servos. Larger models with heavy duty and dual servos should use the RAM 25. The device is 1 1/4" x 1/4" x 5/8". Weight 1/2 oz. Now with generic connectors for "plug and play" installation. RAM 11 LOW BATTERY ALARM. The new RAM 11 gives an audio AND visual low battery alarm for your 4.8 volt receiver OR 9.6 volt transmitter battery You will hear a beeper AND see a warning red LED if your battery charge is low. The device is 1 3/4" x 1 " x 5/8". and weighs 1/2 oz. RAM 12 LOW FUEL LIGHT, GLOW FUEL MONITOR. You can now have a visible warning when your tank reaches the low glow fuel level point that you set. This 1/2 ounce device turns on a bright light mounted on your model which can easily be seen in a fly by or hover. Draws power from the receiver battery only when the warning light is on. RAM 17 PLANE FINDER MARK II. The new standard for finding lost models! Rugged and powered by its own battery, this system doesn't depend on the receiver and battery that probably caused the "fly away". Flip the arming switch and it remains silent for 15 to 20 minutes after which it beeps at 65db at 50 feet for up to 4 days with an alkaline 9V battery Easy to use, it works with any radio system, even PCMs. Judged best by R/C Modeler Jan. 98. RAM 18 BIG AIRPLANE RF DE-GLITCHER. These small beads (1/4" x 7/8") eliminate the use of bulky and expensive chokes to protect your radio from long servo wire RF interference. The 10 beads in each package are usually enough to protect 5 servos in a typical installation. Instructions include a mini-course in glitch elimination. RAM 22 SIMPLE CYCLER. Why pay for another charger when you already own one? Cycle up to 600 MA, 4.8 volt receiver and 9.6 volt transmitter batteries the easy way throughout the year. The Simple Cycler gives you an audible warning when your packs are discharged to the level recommended by battery manufacturers. Then safely recharge with your radio system's charger. You can easily determine the percentage of use and charge remaining in your pack, as well as get an early indication of cell failure. For receiver packs higher than 600 MA see the RAM 26. RAM 25 BIG MODEL BATTERY BACKER. With a 10 Amp capacity this system will handle the demands of large models with heavy duty and dual servos. It operates just like the RAM 09, above, and comes with two heavy duty switch harnesses to carry the heavy amperage loads. This new model is smaller, (1 3/4" x 1 3/4" x 1/2") lighter (1 oz.) and simpler to install than the original model. RAM 26 BIG BATTERY CYCLER. Now you can cycle your big 4.8 volt packs (600 to 4000 MA) with the same efficiency of our famous RAM 22 Simple Cycler. RAM 43 DUAL IGNITER. For 2 cylinder engines with all the features of the RAM 49 and 50. Uses a 2500 MA Sanyo Cell and 2 DuBro plug connectors. 1 1/4" x 2" x 2", 5 oz. RAM 45 BOAT SAVER WITH PUMP. Our RAM 44 bilge water sensor is attached to a small pump so that the warning light signals you of water in the boat while the pump removes it. RAM 5O IGNITER. Now you can have the dependable low speed engine performance of an on board glo driver that can also start your engine and for little more than the cost of a regular nicad field starter. Features a built in 1800 MA battery that can be charged with your receiver charger. The system has an LED monitor, is reversible, adjustable "on" point, optically coupled and will shut down automatically. A generic receiver plug and DuBro glow plug connector are attached. 1" x 2" x 1 1/2". Weight 3 oz. Complete system, charge connector required, Y harness optional. RAM 62 SERVO FAIL SAFE MARK II. Save your model and maybe more! Anytime your model loses transmitter signal, this device will automatically move the servo it controls to the failsafe position you have preset. Example: Stop or reduce the engine throttle and greatly minimize the chance of severe crash damage. Response delay is adjustable from 0 to 5 seconds. It is also WATER PROOFABLE and features a flat design that is half the size of a credit card. This new version has two generic connectors and will work with any receiver. RAM 83 RADIO SIGNAL WATCH DOG. This 1/2 ounce device plugs into your receiver and provides 4 services. The beeper will warn you of any interfering transmitter signal, the lack of your transmitter signal and simplify range checking. It also acts as a plane finder for non PCM radios if the receiver and battery are operable. A generic receiver plug is attached. RAM 90 ALARMIST. Used in conjunction with your peak detector charger or discharge load, a beeper sounds when you reach full charge or safe, deep discharge for 6, 7 and 8 cell batteries. Circuitry allows you to do both functions simultaneously You will immediately know when your battery pack is fully charged or deep discharged. RAM manufactures analoque sound devices (31, 38, 39, 40, 48) in order to provide accurate sounds and good value. RAM 31 3 WAY SIMPLE SIREN. This compact but loud system offers a choice of three distinct siren sounds for cars, boats, and planes. The system comes with a 2" speaker. Weight 3 oz. Requires a 9 volt alkaline battery. RAM 38 GAS/DIESEL ENGINE SOUND WITH HORN - 4" SPEAKER. You choose either a gas or diesel engine sound with adjustable horn for your electric car, truck or boat. Idle rate and top speed are also adjustable. Simple 4 wire hook up. Completely assembled, includes 4" speaker. Compact state of the art design is synchronized to motor speed. 6 to 14.4 volt input power. Perfect for 10th scale cars and trucks, Dumas Chriscrafts and Tugs, Midwest Trawlers etc. RAM 39 VW CAR ENGINE SOUND AND HORN. Very compact. Completely assembled with 2" speaker and horn switch. Synchronized to car motor speed. Operates 6 to 14.4 volts. RAM 40 GAS/DIESEL ENGINE SOUND WITH HORN - 2" SPEAKER. Uses the same sophisticated sound device as the RAM 38 but with a 2" speaker to allow installation in smaller cars and boats. RAM 48 STEAM ENGINE SOUND, R/C. The 1 1/4" x 3 1/4" module produces the realistic chuff and hiss sound of a steam engine. The sensor board synchronizes the speed to the turning prop shaft in your model. Completely assembled with a 2" speaker. Operates on 6 to 14.4 volts. Accoustically recorded, these digitally accurate sounds are produced by an amplified 1" x 2 1/2" circuit board, weight 2.5 or 3 ounces and comes with a 2" or 3" speaker. These complete systems also include a power switch, servo actuated control switch and a speaker amplification box. EVERYTHING needed for control by your radio! Power by 9 to 18 volts. Optional control by RAM 30, 35 or 76. RAM 46 MACHINE GUN. A long, 50 caliber gun burst. Special instructions for multiple speakers and other hints commonly used by Show Teams. RAM 61 WHOOPER. This device produces the classic whooping attack alarm common on destroyers and other fast surface ships. RAM 63 FOG HORN. Coast Guard regulation horn tone. RAM 67 SHIP ALARM BUZZER. This is the klaxon sound used for general quarters on military ships. RAM 68 SUB SONAR PING. The clear ping is the tracking sound used to identify the location of underwater vessels. RAM 70 AIR HORNS. The sound of a dual trumpet air horn used on trucks, pleasure boats and small commercial vessels is very distinctive. RAM 71 BIG SHIP WHISTLE. An ocean liner or large cargo ship have a very deep and distinctive whistle sound. RAM 77 STEAM CALLIOPE. The calliope sound was common on river steam boats and at circuses. This device plays a short, up beat tune. Perfect for Dumas Creole Queen and Mount Washington. RAM 78 RIVERBOAT STEAM WHISTLE. The blast of the riverboat whistle was distinctive from other larger and smaller steam boats. See RAM 61 for full details. Perfect for Dumas Creole Queen. RAM 79 JET ENGINE. This device gives the distinctive whine of a jet turbine engine. RAM 80 OLD TIME STEAM WHISTLE. Small steam launches and other small steam tractors and logging engines had very distinctive whistles. Perfect for Dumas Brooklyn, Midwest Seguin. RAM 81 16 INCH DECK GUN. The roar and echo of a large gun is provided by this device. See RAM 61 for full details. RAM 82 TUG BOAT WHISTLE. Modern diesel tug boats have a very specific air horn sound. See RAM 61 for full details. Perfect for Dumas Shelly Foss etc. RAM 167 MERLIN ENGINE. Same features as the 166 but with V-12 . RAM 168 RADIAL ENGINE. Same features as the 166 but with round engine sound . RAM 171 WW I MACHINE GUN. Has slow firing rate of a synchronized gun . RAM 179 3D Lites 3D fliers can now have a multi lite effect designed for them. This 18 lite system has 6 red, 6 green and 6 yellow LEDs, each on a 24" strand. Total weight is 23 grams, draws 30 ma in a 10 minute flight and runs on 8 to 12 volts. RAM 182 GENERAL LEE HORN. This unit provides the famous multi horn sound of the Duke's Dodge Charger. RAM 185 ROTARY ENGINE. Same features as RAM 166 and gives the unique "burping" sound of the WWI engine. The sounds listed above are in stock at all times. We are well aware that there are many other sounds that an individual modeler may want. or you may choose to record your own voice for conductor calls or have our voice record your script. Any custom recording is the cost of the digital device, $39.95, plus $5.00 for the custom chip and $6.00 for return U.P.S. Call RAM for further details.